The second entry in the G.I. Joe franchise succeeds in several areas where its predecessor failed. Most importantly, G.I. Joe: Retaliation feels like a true, outlandish battle between the hero Joes and the dastardly Cobra that my 12-year-old self would’ve loved. And the contemporary version of me had a lot of fun, too. This film forgoes the goofy sci-fi modern actioner tropes and stays rooted in the mission at hand which, while also goofy and preposterous, is more straight-ahead action that better suits the elite military team. As the rugged Roadblock, The Rock brings a macho edge matched on the other side by Ray Stevenson as Firefly, the hard-hitting Cobra commando. These two have a knife fight (only with guns) that pushes the PG-13 rating. 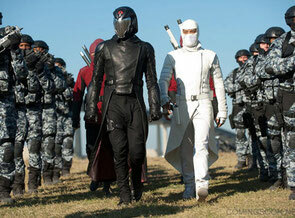 That bravado is balanced by the story of Snake Eyes (Ray Park) and Storm Shadow (Lee Byung-hun), ninjas on opposite sides of the conflict with a history that dates to their childhoods. Roadblock vs. Firefly; Snake Eyes vs. Storm Shadow, it all sounds ridiculous and it is. And that’s not mentioning the escaped Cobra Commander who wears a reflective helmet that hides his disfigured face or the United States President who is actually a nefarious body double (Cobra operative Zartan) with a plan to take over the world. It all starts with the president sending the Joes on a doomed mission to purposely wipe them out. Roadblock and two members of his team survive - Flint (D.J. Cotrona) and Lady Jaye (Adrianne Palicki) -to devise a way to stop Cobra’s endgame. While Cotrona was bland and not memorable in the least as Flint, Palicki does well with the role of Lady Jaye, balancing the eye-candy character with an earnest fighting spirit. Logistics and lack of resources be damned, the triumvirate is able to uncover the plot and with the help of retired General Joe Cotton (Bruce Willis), who thankfully has a full arsenal of weapons hidden in his suburban home, take action. The characters played by Willis have become completely indistinguishable – it’s as if he wandered straight from the set of the abysmal A Good Day to Die Hard to this film with nothing more than a quick wardrobe change. But here it’s a small, palatable dose of him sleepwalking through. The G.I. Joe universe that inspired the films is one of huge personalities and conspicuous characters outfitted in distinctive gear. Director Jon M. Chu does a capable job of taking those over-the-top character definitions and transplanting them into a real-life cartoon that is multi-dimensional and tangible without being too serious. That does become a problem, however, when the utter destruction of London and death of millions is treated as an afterthought. Lots of things go boom, lots of colorful characters spout ridiculous lines, and the franchise appears to be headed in the right direction. We just need the newly helmeted Cobra Commander to step to the forefront now that plot lines from the first film have been resolved.